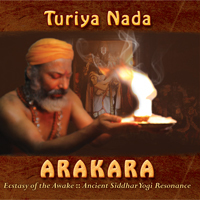 For those serious about the inner journey, Arakara contains a rare sound recording on this track Siddhi Ganapathy and the “INNER AUM” The chant of the Inner Aum is an ancient Siddhar technique, never before heard of in the Western yoga world till date. It is the high pitched sound in the track. Kundalini. When we are awakened to supreme ecstasy by the union of ourselves with Source, a light runs up our spine and exits as a halo of light around our crown- and we become the form and shape of “Vel”, the spear of Light. Lord Muruga who carries the Vel, awakens us in this Kundalini dance. This song is dedicated to Lord Vishnu, our awake mind as in the mantra “GOVINDA”. In all religions, reference to the prophet has often been as the shepherd. The “shepherd” refers to the thoughts of the mind directed towards Source. Govinda means “the cowherd.” The cow is our abundant mind that knows the dharma/goodness/love of simply giving as Source is ever giving to us in abundance, if we awaken to be conscious of this awareness. To herd each thought to Source is to be Govinda. This mantra, “AYYA SIVA SIVA SIVA SIVAA; ARAKARA, ARAKARAA” is an ancient Siddhar mantra that connects us to the lineage of Siddhar Thirumulanathar, Siddhar Bhoganathar, Siddhar Kalanginathar among the few ancient Siddhars named. This is Guru Ayya’s mantra. Within all we experience as reality and as matter is energy- the Goddess. The Goddess when invoked as Energy is invoked as a simple but potent resonance. We are awakening our inner fires of grace. One of the basic nature of the mystical pathway of the Siddhars is simplicity and experiential wisdom instead of intellect. When our intent to invoke the Goddess is from the heart and our mind can grip as simple mantra resonance as “AUM SAKTI AUM SAKTI AUM”, the Goddess is invoked within us as Mother Kundalini. “Laa” is the essence of Allah, a paramount name of God whose grace is abundance of whatever we desire. Allah as God is a beautiful grace to invoke. “AUM” is the heart within each living creature, the home of Source/God. SHAALOM is the intent of Peace- the peace of realizing the One as Oneness- the peace of Mahatma Gandhi’s single worded life message- Ahimsa. Ahimsa means non-violence, non-killing, non-hurting any living creature. As we sing Shaalom together, let us foster the birth of higher consciousness for humanity as in realizing Peace that is Ahimsa. Blessings of the mantra Shaalom- peace for ourselves and our realities; peace for humanity; peace for all the living’ awakening higher consciousness for Planet Earth.